Spike Lee's police infiltration period piece is as a high-energy filleting of modern-day America. If you’ve been pining for the fiery, political Spike Lee of ‘Do The Right Thing’ and ‘Malcolm X’, good news: ‘BlacKkKlansman’ has the director back to his energised best. Maybe the optimism of the Obama era robbed him of some of that righteous fury – which would be one explanation for the limp ‘Oldboy’ remake – or maybe middle age mellowed him; either way, Trump-era America – Charlottesville, Black Lives Matter and all – has brought the old mojo flooding back. Veering from blaxploitation spoof to undercover thriller and ending with a no-punches-pulled real-life coda, it’s riotous fun one minute, savagely biting the next. The story, as the opening credits chart, is based on some ‘fo’ real sh*t’. It’s the kind of ‘fo’ real sh*t’ it’s hard to believe actually happened in Nixon-era Colorado Springs, yet it’s all based on a true story. Black police officer Ron Stallworth (John David Washington) joins the local force, where he’s warned that he’ll have to ‘take a lot of guff’. Sure enough, the guff comes thick and fast, as he’s exiled to the archives and harassed by a racist colleague. Spotting an ad for the local chapter of the Ku Klux Klan and taking the initiative, he phones up ‘the organisation’ claiming to be a vitriolic white supremacist and sets in motion the most unlikely undercover operation in policing history. The first thrill of contact with the enemy is only slightly diminished by the realisation that he’s used his real name. Cue hysterics from his fellow cops. 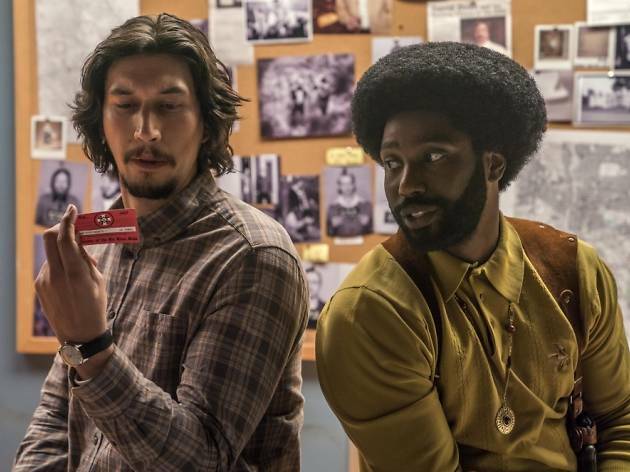 Of course, Stallworth can’t meet the Klansmen in person, so in steps fellow detective Flip Zimmerman (Adam Driver, even more deadpan than usual) to handle the face-to-face stuff. The fact that he’s Jewish should increase the risk but this cadre of racists is so dim, only Jasper Pääkkönen’s paranoid redneck comes close to smelling a rat. It all soon leads to Topher Grace’s oily David Duke, and gives Lee the chance to tug hard on the film’s links to modern-day America. The Klan are a bunch of clowns, sure, but Lee never lets us forget that they’re not using aliases or unlisted numbers – they’re marching in the streets. 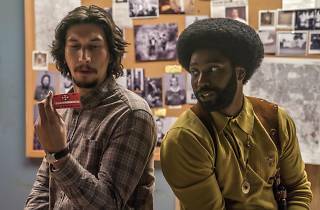 If a few tonal lurches make ‘BlacKkKlansman’ a touch uneven, and a romantic subplot with Laura Harrier’s student radical doesn’t quite land, its comic beats give a flavour of what a Spike Lee ‘Naked Gun’ movie might look like – awesome, by the way – and that welcome impassioned, earnest side is never far from the surface. Stallworth’s first undercover op at a Black Panther rally has individual faces backlit in rapt attention to a Malcolm X-like orator. It’s one of a few powerfully cinematic moments in a movie that has the scrappy, rough-around-the-edges feel of a filmmaker in a hurry. This film is surprisingly tedious for such an interesting slice of history. For one thing, it's arduously long; Spike Lee desperately needs a tougher editor. And the characters tend to be one-note; the female activist character isn't a real person, but a walking lecture. It's a shame that a more thoughtful film couldn't have been produced out of this fascinating story. Okay this has received rave reviews; maybe I watched a different film? Maybe I needed to be high or mildly tipsy but either way I saw it sober and, well, it was good not not that good... some huge logic flaws... they had a black man making calls to the klan... well why didn't they just get one of his white colleagues to make the calls? Why did he have to make the calls? When his partner met the head of the Klan he had rot keep up the ruse which meant he had to be a good actor and also able to spin a damn good yarn, well if he's able to do that in person he's MORE than able to do it on the phone! Ridiculous... I know it's true but they needed to do a better job of explaining why! Although the trailer made it seem like more of a comedy film, this was a brilliant depiction of the true story. It really does make you think and definitely a film to watch this summer. The acting and directing were brilliant! Beautiful blend of reality and true story lighting the mood for excellent comic timing. It's interesting how stories of the past can be so relavent today. This is a reminder of what a great film maker Spike Lee can be. This is a full blown assault on all senses, alarming, disturbing, entertaining, and hilarious. Based on a "true" story of a black policeman's very bizarre relationship with the Ku Klux Klan. It just has to be seen. Hugely enjoyable period-piece that brilliantly recreates the racial and cultural tensions of 1970s USA, and cleverly suggests their relationship to contemporary America - suggests, that is, until the last 2 minutes when they are rammed home in a rather clumsy way. Spike, we got it, you showed us, no need to tell us too. Other than this artistic mis-step, this is great stuff, and one of Spike's best - some wonderful performances throughout, with mention having to go to John David Washington in the lead role - son of Denzel, the talent clearly has been passed on. Great soundtrack too. Definitely one to catch at the cinema. I usually have this problem with much hyped, Oscar worthy films. Will it live up to the media junket? Working in Marketing and PR, I know the tricks and sleight of hand marketeers pull to get you interested in the product. Thus, I'm usually forewarned and forearmed when I hit the multiplex. I'm happy to say I was wrong here. Spike Lee is back to the height of his creative, provocative and entertaining best. Funny, frank and foul mouthed he makes an interesting story even better. An entertaining light trip through an unexpected story, ending with the inevitable references to Trump's white America. Analogue rather than digital film with some good period touches but limited budget. A surprisingly friendly white police force with just one racist cop, Spike just seems grateful to be let out to play with this film. You'll come out thinking, yep here we go again, heads down for a racist society. Popcorn social commentary, easy to swallow.